Solar inverter intelligence and monitoring has evolved mightily over the last few years, from silent rows of capacitors to today’s circuit-programmable, WiFi-enabled guardians of PV arrays. These systems sense minute changes in operation and advise system managers of options, in real time, for energy management and O&M (operations and maintenance). The capabilities of internet-based monitoring platforms also offer an ever wider variety of functionalities, from data logging of production and consumption, to energy storage coordination, to time-of-use or peak rate recommendations. There is more than enough data for every level of user. “Different roles for installers and system owners ensure that the right amount of data and the right functionalities are available to the right people,” says Richard Baldinger, a spokesman for Fronius USA, which has been evolving not just its product line but its installer base to best use these new bells and whistles to their advantage. While new functions have emerged, some older functions have been refined of late. “Greater inverter automation and alerts to installers that enable improved and more efficient O&M are now common place,” suggests Stefan Grosjean, the CEO of Kortrijk, Belgium-based Smappee. One way inverter monitoring functions have grown is with the shift to module-level power electronics. SolarEdge, a pioneer in power optimizers, offers a DC optimized solution that manages and monitors energy to maximize power generation. With such module-specific monitoring, array designers have increased flexibility with array design, including more ability to work around the problem of shading and uneven irradiance. MPP tracking over time can also help inform O&M considerations. “Detailed data points such as voltages and current per MPP tracker help to identify potential problems in the system. 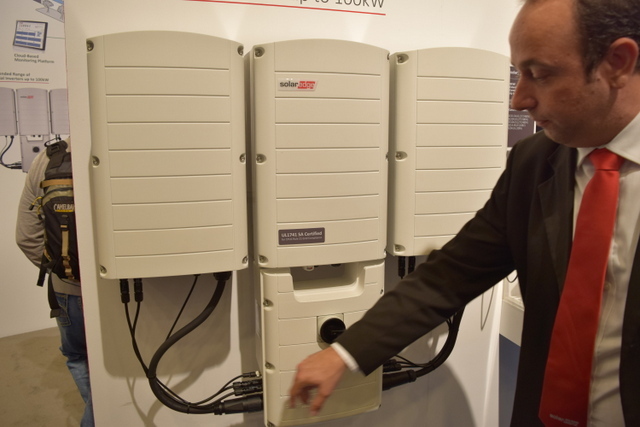 With the inverter being the heart and brain of a solar system, any state or error code shown by the inverter and its monitoring platform help identify errors throughout the entire system,” Baldinger says. The wealth of module-specific data has brought a substantial shift in the commercial and utility market for inverter monitoring. For example, the increase in information granularity permits more string inverters to be used in place of a central inverter, notes Cedric Brehaut, the executive consultant at San Francisco-based Solichamba Consulting. 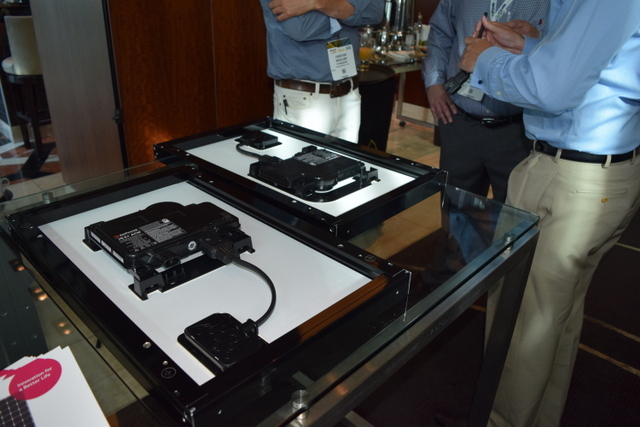 “Going one step further in innovation, Huawei is now offering three-phase string inverters with built-in IV curve tracing functions,” Brehaut says. IV curve tracing, which identifies the maximum power point for captured irradiance, is the best way to measure the performance of a panel or an array. Traditionally, IV curve tracing requires on-site work that now is being built into the inverter and accessible remotely via the monitoring software. Beyond module- and chain-specific data, the frequency of data in monitoring has risen to time units of minutes in place of hours or days. This avalanche of data enables monitoring systems to consider utility peak rate or time-of-use rates to curtail the consumption of energy from the grid during higher cost periods. “By simply visualizing the consumption in real time, the so-called Prius effect can occur, meaning that the raised awareness for energy consumption can lead to changes in behavior and, with that, a decrease of consumption,” Baldinger says. “Consumption monitoring makes energy more visible, and visualized real-time data is more tangible than the numbers on the utility bill.” Fronius recently re-designed its monitoring platform Solar.web, with improved usability and new analysis features for this very reason. Encompassing data feeds also provide the ability to drive advanced analytics to predict component failure so that O&M can be strategically planned. Advanced analytics involve benchmarking performance against similar plants, normalized for capacity and weather, as well as against a modeled plant that is based on historical operating data and weather conditions. However, such a capability is far from mainstream adoption yet, Brehaut suggests. “Monitoring software provider QOS Energy reports that only 10 to 20 percent of its clients currently use the benchmarking and digital twin functions built into the platform,” he says. 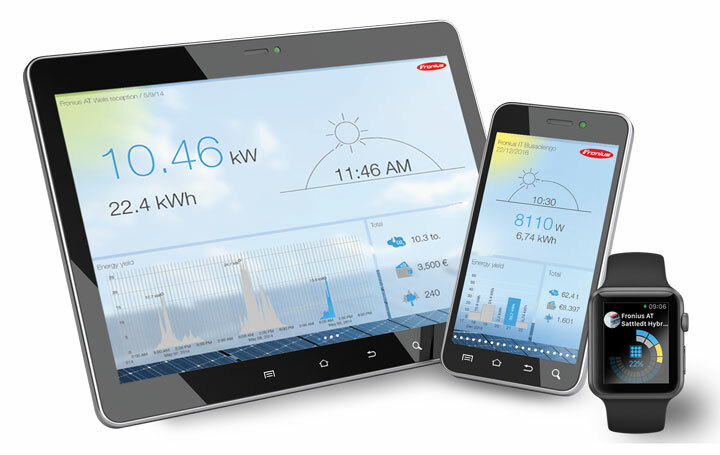 Fronius re-designed its Solar.web monitoring platform, improving usability and analytic features. 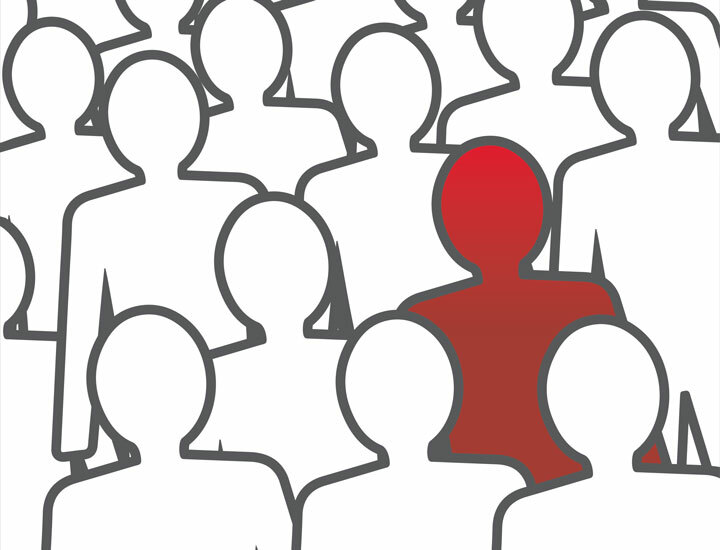 As such rich functionality developments add more value to monitoring, the relationship between the customer and the monitoring system provider changes substantially. This new possibility of customer service and interaction is the next big opportunity for the solar industry to evolve. “Upselling strategies throughout the lifetime of a system make a solar system sale less transactional and more based on long-term relationships, creating win-win situations for both installers and system owners,” Baldinger says. A solar monitoring platform is the key in this new frontier of customer relationship, lead management and upselling, including opportunities in solar system expansions, storage and energy efficiency. That transition requires preparation, though. “Clearly there is an opportunity for installers to sell monitoring and O&M services if they are up to the task,” Brehaut says. “They have to be ready to deliver, despite limited resources; the way that service calls weigh against new installs can be an issue. The ability to view status codes remotely helps a service provider to determine whether a truck roll is necessary or not. 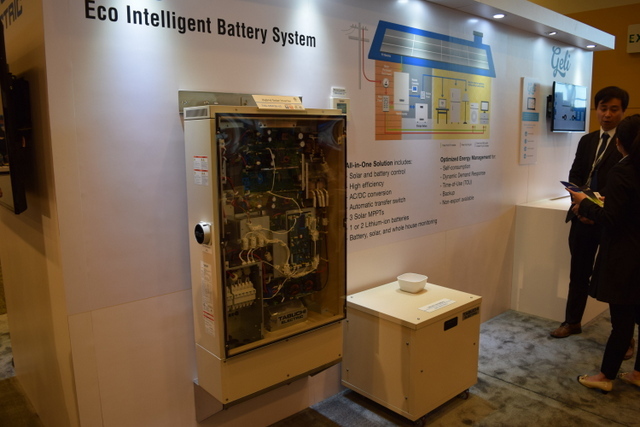 Smart home monitoring provider Smappee cautions that basic inverter monitoring and basic smart home management are, at least for now, largely different functions. “Internet-based inverter monitoring is not a substitute for smart energy monitoring. Likewise, today’s smart home energy monitoring systems like Smappee Plus may measure solar PV consumption, but they are also not a substitute for the manufacturer’s inverter monitoring systems. Rather, the two products should be seen as complementary,” the company explains. Smappee’s latest innovation, Smappee Plus, acts like an energy traffic controller that can automatically steer excess solar energy production to home appliances in order of preference, further increasing a homeowner’s energy efficiency and cost savings. For example, if a consumer is simultaneously charging their EV and cooking on an electric stove, Smappee Plus can control and reduce the power that goes toward the EV until the homeowners finish cooking to avoid fuses from blowing. Afterwards, the car will receive more power again. Smappee, a developer of smart energy monitoring solutions, was named a CES 2018 Innovation Awards Honoree for its latest energy monitor and home energy traffic controller, Smappee Plus, which we named one of the coolest things we saw at Intersolar this year. Products taking part in the CES program are judged by a team of industrial designers, independent engineers and members of the trade media to honor outstanding product design and cutting-edge engineering across 28 consumer product categories. Smappee Plus measures real-time energy use from household appliances, offering valuable insights into a homeowner’s energy use and production. 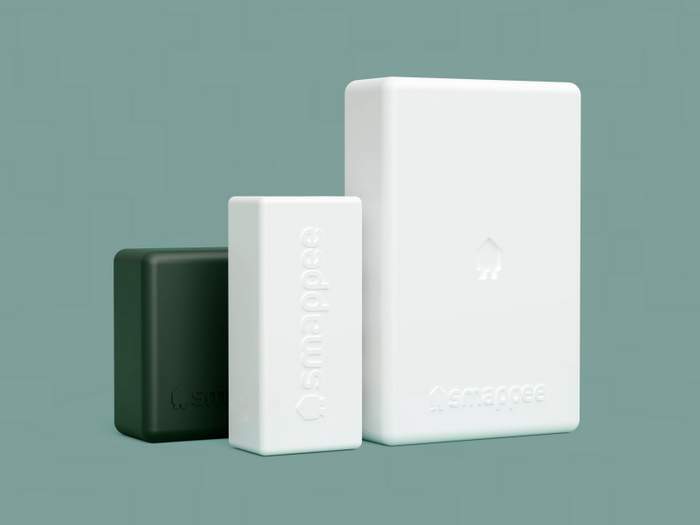 Smappee Plus is the only energy monitor that combines load disaggregation with submetering technology to provide real-time data also for appliances with variable output –such as air conditioning, electric vehicles, heatpumps, etc. Consumers are able to see how much energy a device uses and its daily, monthly or annual energy costs. Consequentially, owners can make informed decisions on their energy consumption (e.g. when to buy a more energy efficient fridge) and act to save on energy costs and efficiency. Smappee Plus is also the only energy monitor that you can program to take on the role of an “energy traffic controller” in the home. The product can automatically steer excess energy production, such as solar power, to appliances in order of preference, further increasing a homeowner’s energy efficiency and cost savings. You can choose from numerous “recipes” that automate certain actions. For example: when you are simultaneously charging your EV and starting to cook on an electric stove, Smappee Plus will control and diminish the power that goes to your car until you’ve finished cooking to avoid your fuses from blowing. Afterwards, the car will receive more power again. Because of this energy traffic controller function, Smappee Plus is also a tool that enables the future vision of turning homes into decentralized energy hubs that can produce, sell and buy renewable energy. The Smappee Plus is compatible with smart Comfort Plugs and various IoT platforms such as Amazon Alexa, IFTTT, Stringify and more, which allows the homeowner to automate activities or control appliances from a distance. It’s also the first energy monitoring system to be integrated with the cryptocurrency, SolarCoin. Smappee will be at CES 2018 from Jan. 9 to 12, exhibiting at booth 40234. Another Intersolar has come and gone, but the product innovations, large and small, are here to stay. At least until next Intersolar. 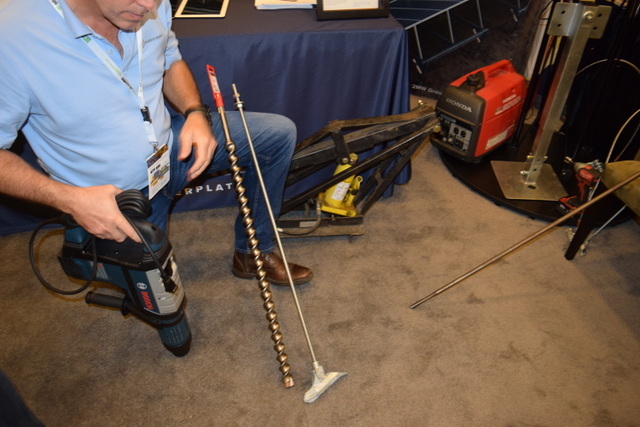 If you missed the event, or didn’t have time to see all three floors, here are some products that stood out to us in the exhibit hall. Array Technologies is the market leader in central drive solar trackers. 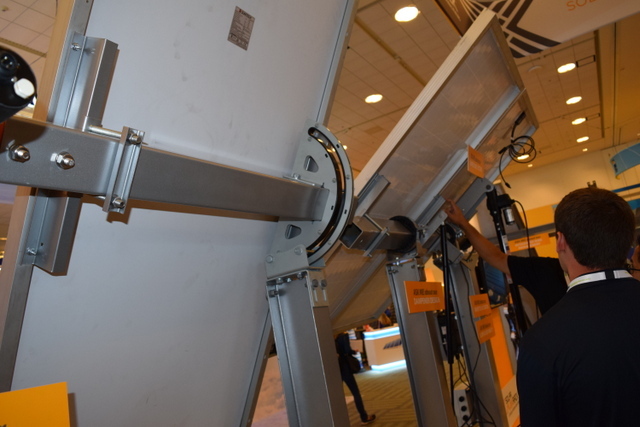 Array tries to minimize parts count wherever it can (150 MW of PV only needing 150 components total), and we stopped by the booth to check out some of the handy new tweaks made to its DuraTrack HZ v3. In addition to a built-in above ground wiring component, we thought this quick disconnect driveline was a smart, simple improvement for those who have always wanted a streamlined way to move the driveline for maintenance activities. Ecofasten maybe wins our award for variety of new solutions packed into one booth at Intersolar. Many of these items aren’t fancy – like partnering with Unirac on an install kit (packs of 10) – but as most of the names suggest, they are simple, which is often even better. Like this new (so new it isn’t officially named) Rail-Based Tile System. The flashing itself replaces one complete tile, so no cutting, drilling or grinding there. After the stud and simple seal bushing are fastened to the tile base, place the flashing over, pound it with a hammer to form a hole over the stud and then install the L-foot with a bonded washer and nut. 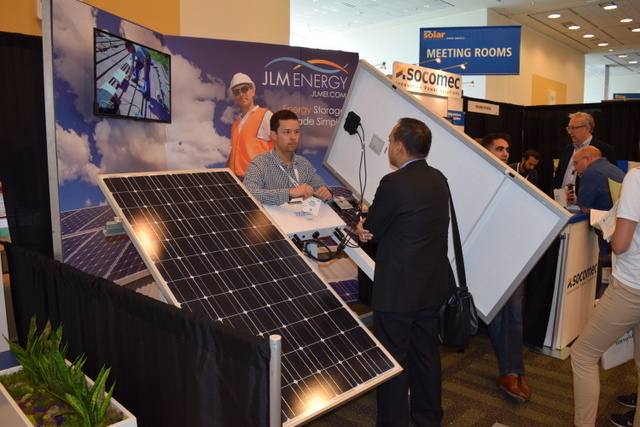 JLM Energy launched a new energy storage product category called MicroStorage — a battery pack that couples directly to a corresponding solar panel, as you see here. JLM says the advantage of its Phazr’s microstorage approach is that a single solar panel can concurrently charge a battery and deliver energy to the grid. The simultaneous nature of electron flow is unique to JLM’s patent-pending technology. 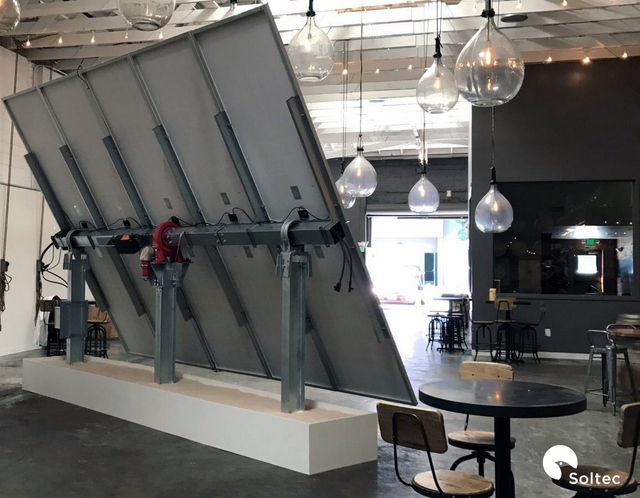 The Phazr is designed for large scale solar plus storage applications, and is also perfectly suited for smaller residential and commercial installs. 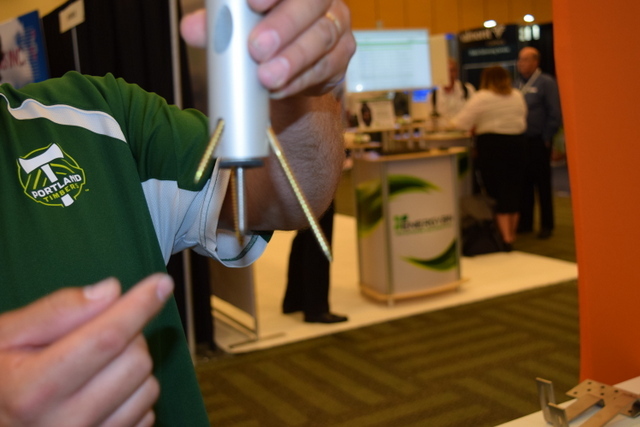 This could be a gamechanger for ground-mount installations. Nuance Energy has a new solution, inspired by an old solution: anchoring. Nuance Energy wants to lessen the amount of steel needed on a site by not driving any into the ground at all. Using the pieces you see above, a hole is drilled, the anchor is driven down 40 inches into the soil and pulled by an uplift device. As the anchor turns and is pulled there is a natural ballasting that occurs using the earth itself. Utility poles are anchored using this strategy. This could drastically save on traditional installation, and even created a new “lift and shift” category, where a portable unit is fixed into place on a drilling or mining site and then removed once the project has ended. The combo EV charger / inverter maybe received the most buzz on the floor, but we gravitated to its new wall-mounted 100 kW inverter. Yes, a wall-mounted 100 kW inverter. This prewired three box setup looks like (and installs like) three string inverters, but is commissioned as one inverter. Installing 1 MW in half a day is a possibility. Soltec made a splash at Intersolar this year as it tries to do more business here in the U.S. There is a lot to like about their product, like the amount of panels you can mount in one row (which makes for a more energy dense field), but it was the little things that stood out most. 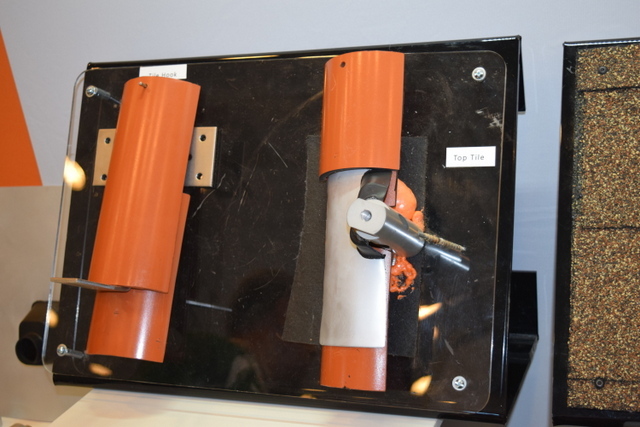 Specifically how the wire management of the system is housed inside the torque tube. I have no live photo of this (it was the afternoon of Day 3 and I forgot — give me a break, already.) but the Smappee is the coolest thing we saw the entire week. Attach it to the cable coming into the house, and the Smappee will listen to everything – what’s turning on and off, how much standby power there is, how much PV is being generated, and on and on. This gives homeowners much deeper (and easy to follow) insight into their home energy consumption and, at the same time, provides solar installers another touch point for customer follow ups and service. The low price point (under $400) makes it potentially an easy first foot in the door. Right off the bat, a homeowner is likely to save 12 percent on their utility bill, just through awareness and optimization tips from the app. From there savings could approach 45 percent. Solar FlexRack launched its TDP Turnkey Tracker about this time last year. The update for this year is a newer, longer single row tracker (90 modules with 2 to 4 more posts), adjusted by a larger motor that will open up larger, utility-scale projects. 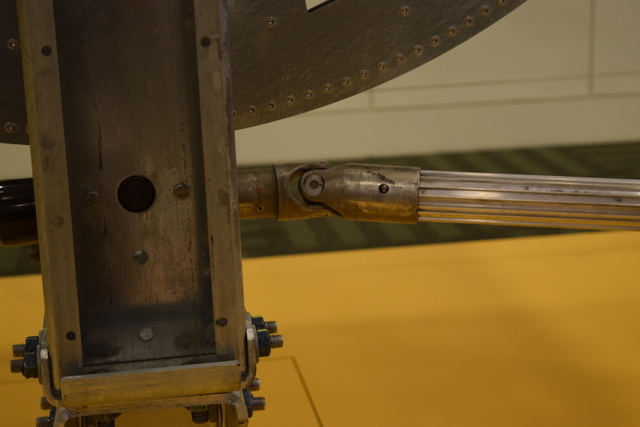 The torque tube is offset to achieve better balance. The attention to detail is big for Solar FlexRack, which is why “turnkey” is built into this product’s name – its slew of engineers are involved in their installations to avoid adding their company name to the list of growing tracker system failures out in the field. The last few years has seen a flood of great tile roof mount solutions enter the market. 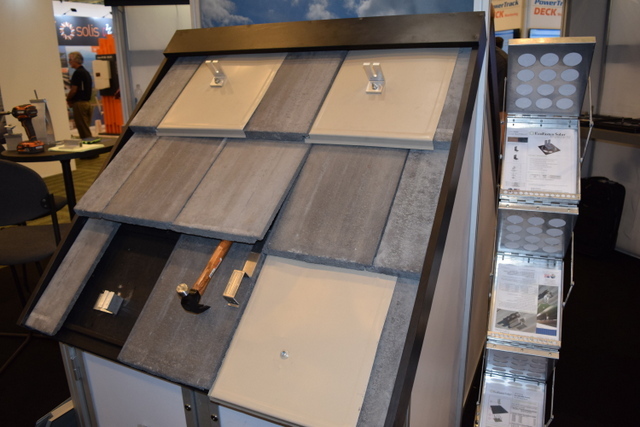 The TopTile Mount that SunModo debuted at Intersolar is an entirely above-the-tile system – no need to deconstruct the tile roof. The tripod mounting stanchion can be mounted on a tile ridge independent of rafter position. This could cut your install time in half, compared to a more conventional approach. Now with a two-battery system setup, Tabuchi Americas continues to improve upon its solar+storage system (now more than 20,000 installs worldwide). Thanks to an integrated transfer switch, everything needed to get a PV + storage system up and running is included in the package, which means at least $1,000 soft cost savings over an unbundled system. In fact, this is one of the first UL 9540 certified systems – the certification specifically for solar + storage systems. Updates to the system’s intelligence has also improved its defenses against power surges from things like water pumps.